A passport-toting, PR-trained, teaholic’s guide to thriving as an independent and modern woman. Who better than Jane Austen to guide the way? All this in a tea cup? Um, yes please. 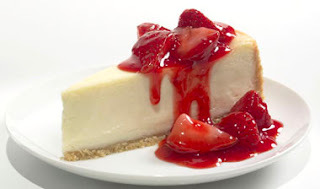 Oh man, oh man, oh man....it's hard to think of any dessert I adore more than cheesecake. Ok, so maybe it's not so hard to think of other great desserts, but cheesecake definitely rates as of my favorites. How appropriate then, that there exists a tea which does it justice. Not only do I get to enjoy all the nuances of cheesecake from this cup of tea, but it's also good for you! This newest addition to the Tea with Tiffany video series takes a closer look at the Strawberry Cheesecake Tea from The NecessiTeas tea company. And yes...it is ridiculously delicious. Any takers? Copyright © 2015 What Would Jane Do. All Images & Content Subject to Copywright. Powered by Blogger.